Hikvision will not stop until they dominate the entire market. Turning on their manufacturer OEMs by OEMing to ADI and Tri-Ed earlier this year, Hikvision now turns on their integrator partners. Inside this note, we examine their direct end user sales program, their new 'self-OEMing', how they are trying to hide it, and what it means to the industry. The most attractive option immediately will be the Dropcam alternative, that is being sold on Amazon for $69.99 + one year of free 7 day storage (which is radically less than Dropcam and every other cloud cam offering). However, Hikvision has now shifted Ezviz to something different. Generally, Hikvision is quick to tout their market position and successes, but with the new 'company' they have buried their name and association. Ezviz is portrayed as a completely separate, independent company. Earlier in 2015, the Ezviz website prominently displayed Hikvision's company info at the bottom of every page and on the terms of service. However, now, Hikvision has removed those references. "EZVIZ, a California-based Wi-Fi cloud camera and video surveillance solutions manufacturer... The company manufacturers Wi-Fi cloud cameras and video surveillance kits, with the single mission to make great quality video easy for everyone." 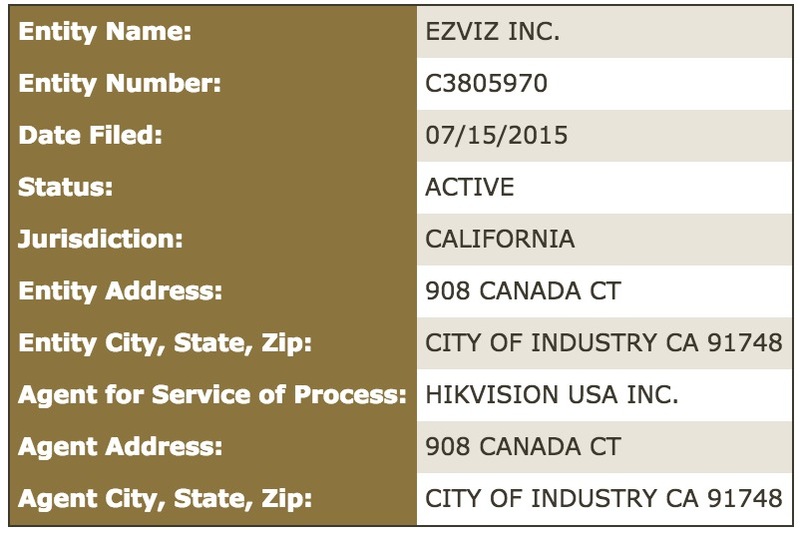 Obviously, Ezviz manufactures nothing, outside of cover for Hikvision. They are, essentially, OEMing themselves. However, Ezviz's managing director cited in the announcement is a Hikvision North American sales employee (Albert Lin) who was transferred over. However, looking up the FCC ID on the Ezviz camera (2ADTD-CSC) shows that the product is registered to Hikvision, not Ezviz. By contrast, in China, Ezviz is clearly marketed as a Hikvision brand, not an independent company. There, they sell many different types of cameras and alarm systems as well. Minimize Hikvision dealer anger. If Hikvision dealers do not know, they cannot be concerned about the conflict. Equally important, if Hikvision's dealer's customer see Ezviz as a different company, they cannot price check / bargain for Ezviz products on Amazon, etc. Obscure Cybersecurity problems. Given Hikvision's repeated hacking problems, many buyers, especially on the consumer side, would have reservations hosting their video with Hikvision. Americanize vs Chinese: Instead of having buyers worry why they are buying from a company whose largest shareholder is a Chinese government owned entity, Hikvision can make it appear that they are just another hi tech California company. The direct sales end user market is already quite big and growing. For example, Swann, one of the specialists in this segment, does over $100 million annual revenue. Amazon certainly sells hundreds of millions of dollars of video surveillance systems. It would not surprise us if Amazon sells more video surveillance than ADI. And as Hikvision continues to drive down unit pricing, it becomes even more attractive for consumers and businesses to simply buy $69 cameras or ~$300 kits direct from Hikvision. There has been short term elation that Hikvision has helped early adopter dealers make money over the past year or two, benefiting from much lower prices. However, this move shows that Hikvision is determined and organized to saturate the market and maximize their total unit sales as quickly as possible. How Hikvision makes profits with their approach (e.g., now selling cloud IP cameras direct, with phone support and free one year storage for $69.99) is a mystery to us. But these moves, if continued, will hurt integrators and crush many of their manufacturer competitors as ubiquitous cheap video surveillance systems become the norm. Comments (113) : PRO Members only. Login. or Join.